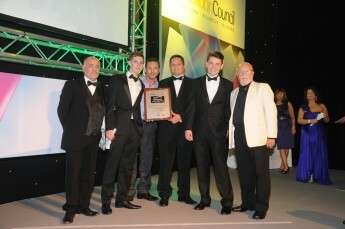 Salix were invited to attend the 2012 Business Awards ceremony at the Town Gate Theatre, in Basildon on July 13th. Salix are proud sponsors of the Basildon Business Awards and Director, Jayson Ball was pleased to have been able to judge the Business to Business Award. Salix were extremely pleased to be announced Winner of the Environmental Awareness Award 2012, as well as being nominated for the Manufacturing & Production Award. Apprentice Sam Latarche was also voted finalist for the Apprenticeship of the Year Award. Managing Director Jayson Ball says – “Winning this award means a great deal to us here at Salix. We try at all times to ask our clients in the Restaurant and Hotel Industry to think hard about their choices of equipment specification. Sustainable and Environmentally Friendly Kitchens are what we strive to design and supply, kitchens that are good for the environment and the operator’s pocket. Through constant research with the Carbon Trust, we look at methods to reduce carbon, save energy, recycle material and specify efficient equipment with low running costs. This award confirms our beliefs in protecting the environment and reducing waste”.